Vepřo-knedlo-zelo — literally means “pork-dumpling-cabbage” but you’ve probably never heard of it. This could have something to do with it usually being a rather plain dish. However, in this recipe the pork is served with red cabbage in port wine and sauerkraut with caraway and stock, making it a little more interesting. The bread dumplings are given a nice flavour using parsley, onion and bacon. In a pan, over medium heat, sauté the red onion in the butter until translucent. Add the red cabbage, and cook for another couple of minutes, stirring regularly. Season with salt and pepper then add the wine. Bring to a boil, cover, and simmer over low heat for 45 minutes. Remove the lid, and cook until all the liquid has evaporated. Put aside whilst preparing the sauerkraut. Rinse the sauerkraut in cold water, and drain well. Place the sauerkraut, butter, caraway and stock in a pan over medium heat. Cook until all the liquid has evaporated, stirring regularly. Put aside whilst preparing the bread dumplings. Cut the bread into 2 cm cubes, and toast in a 175⁰ C oven for about 15 minutes. In a saucepan over medium heat, sauté the bacon until crispy, then add the onion, and cook until golden brown. Let cool. In a bowl, combine egg, milk, and parsley. Add the bread, bacon, and onion. Season with salt, pepper, and nutmeg. Mix well. Leave to rest for 30 minutes, stirring every 10 minutes or so. Pour the bread mixture onto a clean kitchen towel, and shape into a 10 cm long log (about 5 cm in diameter). Wrap the log in the towel, and secure both ends, as well as the middle, with butcher’s twine. Bring a pot of water to a boil. Immerse the wrapped bread dumpling log, and simmer gently for 20 minutes. Take out of the water, and let cool. Unwrap the bread dumpling, and cut into four slices. Sauté the slices in the butter until golden brown on both sides. Season with salt on all sides. In an ovenproof pan over high heat, brown the meat on all sides. Cover with a lid, and cook in a 150⁰ C oven for about 50 minutes, until the internal temperature reaches 50⁰ C in the center. Strain the juices and reserve. Let the meat rest, covered in foil, for 30 minutes. The internal temperature should go up to 60⁰ C. Otherwise, put the roast back in the oven for a few more minutes. In a saucepan over high heat, reduce the meat juice by about 1/3. Whisk in the butter, and reserve. Cut the pork into very thin slices or shavings. The best way to do this is to use a meat slicer, a very sharp serrated knife, or an electric carving knife. Toss the meat slices in the meat juice. To serve: Arrange some meat on top of a slice of bread dumpling. 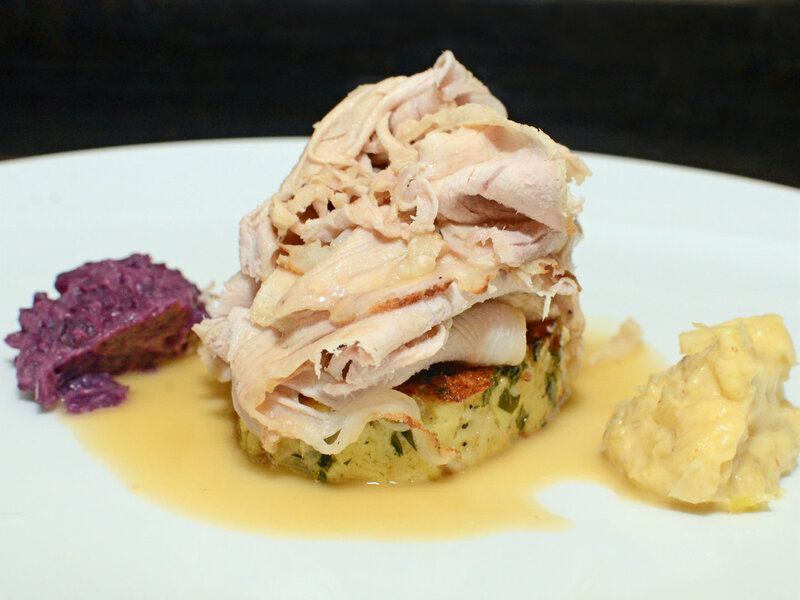 Reheat the red cabbage and sauerkraut, and serve on the side. Florian Pinel was born in France and now lives in New York. He works as a computer science researcher during the week (IBM Chef Watson), and cooks in his spare time. He’s been traveling to Eastern Europe and the former Soviet Union regularly since his early teens. His blog, foodperestroika.com, gathers recipes, travel stories, and other food writings about the Eastern Bloc.